Injection line corrosion is a huge problem on the LB7 Duramax diesels - especially in northern states. 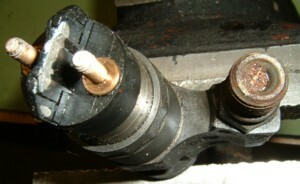 Water tends to collect inside the nut at the injector end of the line causing rust to form. When the injection line is removed, the inlet of the injector becomes filled with rust particles. Many times when we receive core injectors back from our customers the injector inlet is completely blocked with rust. The greatest problem is that if ANY rust gets into a new injector, it will be damaged and require repeat injector replacement which is a high labor operation on this engine. Replacing your injection lines with new Duramax fuel lines at time of injector replacement is very inexpensive insurance against a costly repeat failure. It is extremely difficult to sufficiently clean the injection lines using ordinary methods and new lines from GM are very expensive. 2004 owners only: To verify that these lines will fit your truck please ensure that the eighth digit of your VIN is a '1'. These are brand NEW LB7 injector replacement fuel lines - NOT "remanufactured".